On the 14th of March, LEAP Legal Software will be hosting the inaugural Small Law Industry Summit in Sydney. The summit will be the first event of its kind, with a sole focus on the future of the small law industry. The summit presents a valuable opportunity to discover the latest innovations in legal practice, equip your firm with the necessary tools to succeed in a rapidly evolving industry and make connections with like-minded innovators in other small law firms. Keynote Speaker – Dr Alana Maurushat – Professor of Cyber Security and Behaviour at Western Sydney University – speaking on the role of cyber security in mitigating risk. Christian Beck – Founder of LEAP Legal Software – presenting on getting the best out of human capital, a firm’s most valuable asset. Rose Dravitzki – Head of Chambers at Clarence Chambers – will discuss methods of innovation through strategic business sourcing and structuring. Therese Linton – Founder and Principal Consultant of The BASALT Group – examining ways that small law firms can transform the way that they work to significantly increase productivity. Donna Cooper – Ethics Consultant at Ethics4Lawyers and By Lawyers contributing author – presenting on how firms can manage their ethical responsibilities in a technology-based world. The event will be fully catered and 50% of each ticket sold will go towards supporting cyber security education through a scholarship at Western Sydney University. Register HERE, claim 6 CPD points and automatically enter the draw to win a private harbour cruise adventure for you and up to 10 guests of your choosing. By Lawyers will be attending the Summit – please make yourself known to our team on the day; we love to meet our clients and we value your feedback on our content. We are proud to be presenting as summit partners at the inaugural Small Law Industry Summit hosted by LEAP on 14 March 2019. Tickets are selling fast – Secure your place at the Small Law Industry Summit here and be a part of the conversation on the future of the legal industry. Our Managing Director Brad Watts will be presenting on law firm innovation through the four pillars of improved practice management. The summit will also feature a number of not to be missed presentations from industry leaders on a range of key issues including leadership, risk mitigation, high-performance culture and the fundamental role of technology in shaping the future of the legal profession. Get your early bird pass for a special rate of $95 and Claim 6 CPD points. 50% of each ticket sold will go towards supporting cyber security education – through a scholarship at Western Sydney University (WSU). 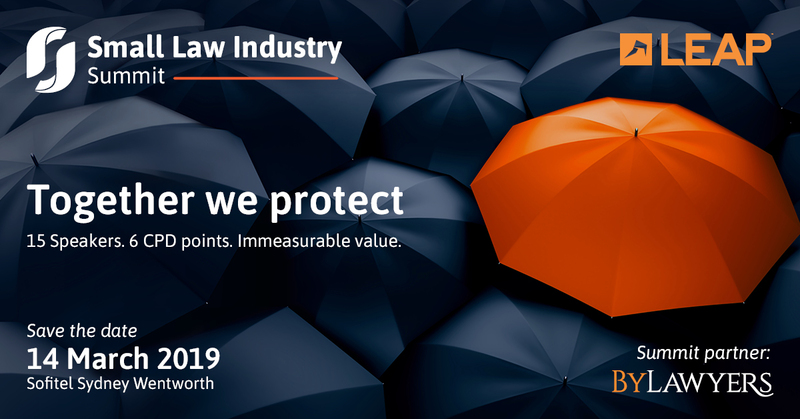 By Lawyers is excited to announce that we will be presenting at the Small Law Industry Summit hosted by LEAP on 14 March 2019. The Small Law Industry Summit is the first of its kind and will showcase some of the legal community’s most prominent thought leaders. Key issues which will be addressed include leadership, risk mitigation, practice management and innovation, high-performance cultures and the fundamental role of technology in shaping the future of the legal profession. refocusing your efforts to find joy in practising law. While it is often overlooked, effective practice management is the cornerstone of building a successful legal practice. Brad has more than 20 years experience in legal practice, including as a partner, director and consultant. His presentation will provide valuable insights for all small firms, whether new or well-established. Register now to see presentations from By Lawyers and other industry leaders including the founder of LEAP Legal Software, AFR Rich-Lister and EY Australian Entrepreneur of the Year 2017, Christian Beck. Attendees will be able to claim 6 CPD points. By Lawyers is dedicated to helping lawyers enjoy practice more. We have over 7,000 precedents and 140 end-to-end legal practice guides. We specialise in offering practical and professional guidance for all major areas of law. Every piece of By Lawyers content is written or reviewed by a solicitor or barrister practising in the applicable state or federal jurisdiction. For over 25 years, LEAP has been at the forefront of delivering innovative technologies designed to advance and protect the efficiency, flexibility and growth of the small law industry. Secure your place at the Small Law Industry Summit here.